Christer Laurén nel gruppo dei ricercatori del Centre for Immersion and Multilingualism dell’università di Vaasa. “The situation reminds me of Ivan Illich (1926-2002) and his book Deschooling Society (1970). Illich maintained that schooling was a model of the centralized consumer society. Schools teach the students to confuse process and substance. Once these become blurred, a new logic is assumed: the more treatment there is, the better are the results, or, escalation leads to success. The pupil is thereby ”schooled” to confuse teaching with learning, grade advancement with education, a diploma with competence, and fluency with the ability to say something new. In brief, institutions tend to end up working in ways that reverse their original purpose. The Erasmus School Frankfurt is a private, non-profit, multilingual day school for children from kindergarten through grade 4. 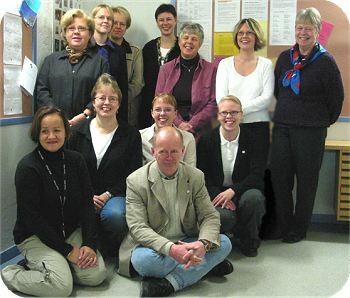 The school was launched in 2006 as part of a parent initiative and the Lehrerkooperative e.V., a 330-member-strong organization operating more than 40 international day care facilities and language training programs in the city. The school’s intercultural curriculum incorporates Montessori pedagogy and immersion method teaching to achieve language acquisition. The three languages currently taught at the school are English, German and Spanish. The school currently has about 60 children in kindergarten and 175 in grades 1 to 4. Classroom instruction takes place from 8:30 am to 2 pm and is followed by afternoon language learning activities from 2 to 4 pm. Child-care services begin at 7:30 am and extend until 6 pm. School tuition is approximately 490 euros a month.